The Keystone XL oil pipeline, pictured under construction Jan. 18, 2012, in North Dakota. Construction of the controversial Keystone XL pipeline would create "numerous" and "substantial" impacts on the environment, the State Department said Friday in a draft environmental impact statement. But the project is a better bet than any of the alternatives, it said in essentially clearing the project to go ahead. The report concluded that the Canadian synthetic crude oil the pipeline is slated to transport into the U.S. produces 17 percent more greenhouse gases than natural crude oil already refined here. In addition, it said the construction phase of the project would result in carbon dioxide emissions equiavalent to about 626,000 passenger vehicles operating for a full year. Without directly saying so, the report signaled the State Department's belief that the pipeline should go ahead, concluding that other modes of transportation would have the same impacts and that proposed alternatives — including an above-ground route and a smaller-diameter pipe — "were not reasonable." And on a central issue of discussion, it concluded that blocking the pipeline wouldn't make any difference in the U.S.'s high consumption of oil. "The Sierra Club is outraged by the State Department's deeply flawed analysis today on Keystone XL," the Sierra Club tweeted. 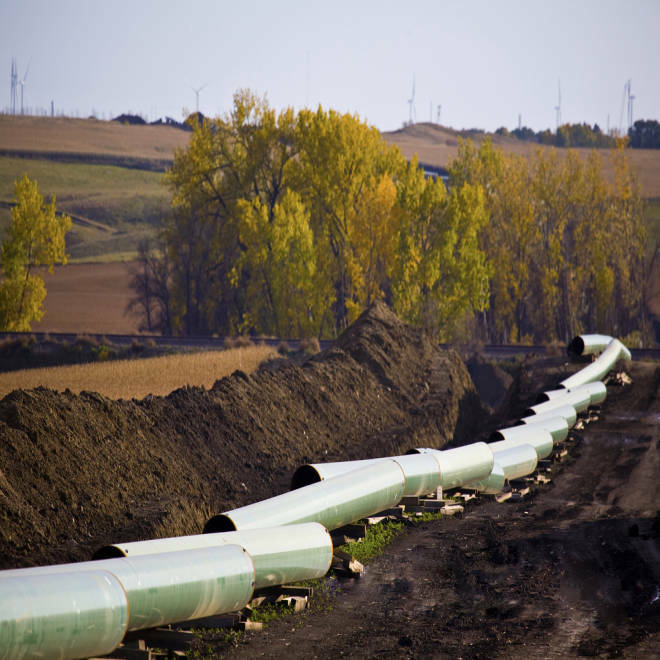 Gene Karpinski, president of the League of Conservation Voters, said the report failed to appreciate the pipeline's potential effect on climate change. "People who think our climate wouldn't be negatively impacted by Keystone XL have their heads in the (tar) sands," he said in a statement. "... LCV will work to ensure that the millions of Americans opposed to this dangerous pipeline have their voices heard during the comment period and that Keystone XL is rejected once and for all." But House Speaker John Boehner, R-Ohio, welcomed the report, which he said "makes clear there is no reason for this critical pipeline to be blocked one more day." "After four years of needless delays, it is time for President Obama to stand up for middle-class jobs and energy security and approve the Keystone pipeline," Boehner said. The environmental statement is only a draft, not a final decision whether to greenlight the project. A public comment period of 45 days is next. A final decision on the $5.3 billion pipeline, a project of TransCanada Corp., has been pending for more than four years as environmental activists battle to kill it, contending that it contributes to the U.S.'s dependence on "dirty fuel" that generates higher emissions than crude oil refined in the U.S. Disturb highly erodible soil along nearly half of the 875-mile U.S. segment — including 4,715 acres of "prime farmland soil." Degrade streams and other surface water. Encroach on the habitats of 13 federally protected species or species being considered for that designation, including the whooping crane and the greater sage grouse. Be susceptible to potentially disastrous leaks and spill. On the other side of the balance, the report noted the potential for economic development and growth in impoverished communities along the pipeline's pathway, saying it could create about 42,000 jobs during the construction period, about 3,900 of them directly employed in construction activities. The report noted that after construction is completed, the project would generate 35 permanent and 15 temporary jobs, primarily for routine inspections, maintenance and repairs. President Barack Obama will have the final say on the project, which is being reviewed by the State Department, not the Environmental Protection Agency, because the pipeline would cross national borders. Obama signaled his support for the southern section of the line last year, but he gave environmentalists a measure of hope in January, when he promised to do more to fight climate change in his inaugural address. Tens of thousands of protesters jammed the National Mall in Washington on Feb. 17 to urge Obama to reject pipeline. They adopted the slogan "Forward" — cribbing Obama's own campaign slogan. The final decision will be a crucial one for Canada, which may need to look elsewhere for new energy markets if the pipeline is rejected. Tom Capra, Catherine Chomiak and Frank Thorp of NBC News contributed to this report. Follow M. Alex Johnson on Twitter and Facebook. This story reflects the following correction: This story misstated the State Department's projection of the number of construction jobs the Keystone XL pipeline project would create. The department's draft environmental impact statement said the project could create about 42,000 jobs during the construction period, about 3,900 of them directly employed in construction activities. The report noted that after construction is completed, the project would generate 35 permanent and 15 temporary jobs, primarily for routine inspections, maintenance and repairs.